In the morning after breakfast we checked out of the Hotel California but were seriously wondering if the Eagle's song lyrics were correct as it did actually seem like we would never leave. The car valet parking took an age to get our car from wherever they had stashed it away during our stay in San Francisco. But sometime before mid morning we were back in Musty and following the Sat Nav (GPS) out across the new Bay Bridge and eventually South East to Merced. 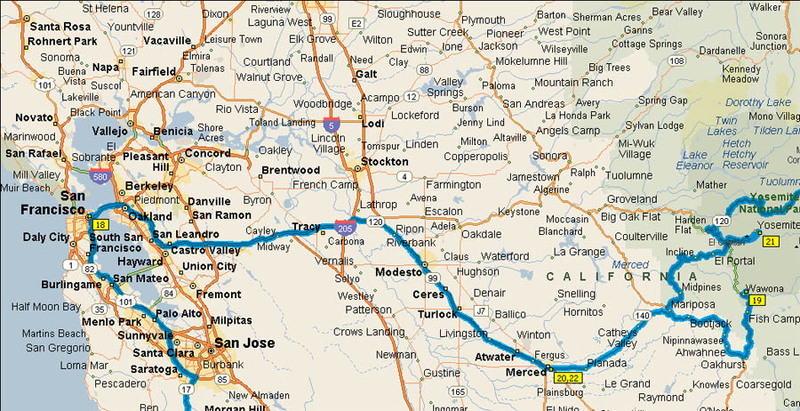 The drive was longish and fairly boring, going along urban freeways. Although even outside of the built-up areas the scenery wasn't particularly interesting. So it was just a slog down to Merced where we checked into the hotel and then almost immediately set off to Mariposa Grove in nearby Yosemite. 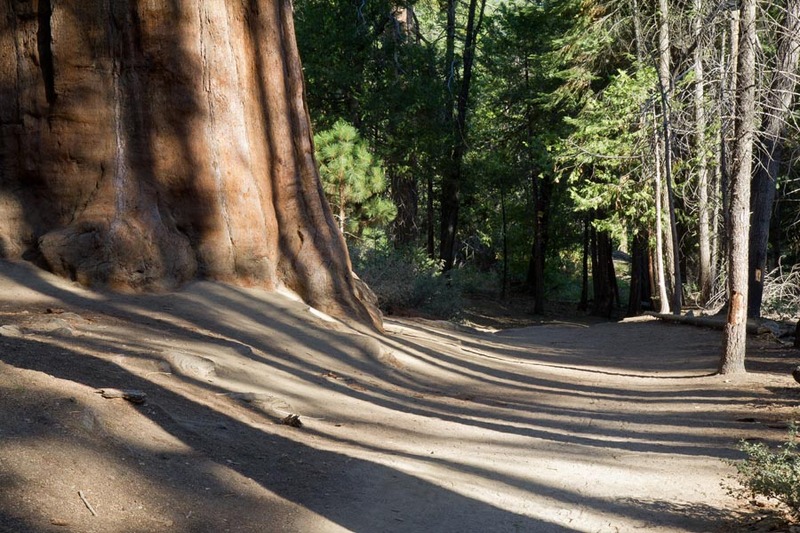 In hindsight, Merced wasn't the best choice of a base for Yosemite and it would have been better to spend more to stay somewhere a lot closer such as Mariposa, if not some of the more expensive lodging in Yosemite itself. Still, the drive from Merced to Mariposa Grove was well worthwhile to see the massive redwood trees. We walked along a trail from the parking lot and fairly soon lost the crowds to have the place to ourselves. Such beauty and tranquility. Also quite humbling when you consider that the large redwoods are much older than you, some ranking amongst the oldest living things on Earth. As with all walking trails and coupled with no detailed map, there were points where we weren't entirely sure we were on the right path heading back to the car. The sun was getting lower making for some lovely light through the trees at one point where I took this fabulous photo. But luckily we came upon the parking lot before too long and, more importantly, before dark! Back in the hotel in Merced we checked on the Tioga Road situation - still closed due to the fire fighters creating firebreaks. But Yosemite Valley conditions were still clear so we would be alright for tomorrow.